This is a new small decent eatery in Hudson Lane right above Telegram Cafe. Situated 5 minutes from Hudson Lane metro station , this cafe is easy to locate. On reaching the first floor you see a door towards your left and there you are. The ambiance is average. The sitting is comfortable. The part i like here is the visibility of kitchen to the customers. You can see chefs working and everything being transparent there. Coming to food , here is what all i tried. 1. Bunny Chow - This was recommended by the server. We decided to go for the channa one. It was channa gravy inside a 3d square bread. The gravy was good. The bread was a little difficult to eat because of its shape. We end up wasting the bread . 2. 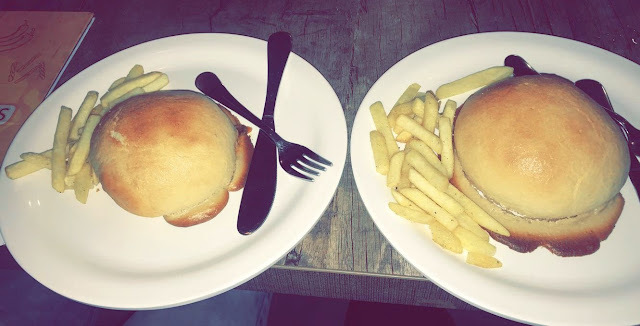 Buns ( veg and chicken ) - Both were a little dry . The part where the filling couldnt reach tasted very bland. 3. Blue Islandnutty Brownie - This was average. Should have been thick but it wasn't. 4. Peach Iced Tea - Tasted great. Must have when you go there. 5. Chocolate cookies - They were fine too.